I have never been able to leave my house without brushing my teeth. I honestly don’t know how some people do it. I love the feeling of clean teeth and fresh breath. John says my morning breath is gross so I am usually brushing my teeth as soon as I wake up and again after my shower. If that is a bit obsessive, then so be it! I have always used just a plain ol’ toothbrush to do the job so I was very excited when I had the chance to review the Oral-B Pulsonic Toothbrush. Even the name sounds cool! 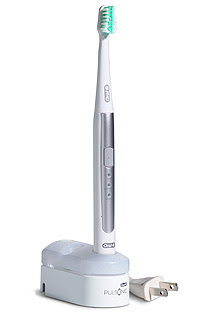 It’s a rechargeable power toothbrush that uses sonic technology to clean your teeth and make them whiter. Some of the key features are the precision bristles that gently polish your teeth to remove surface stains and the professional timer that is set for 2 minutes and has 30 second intervals to keep track of how long you should brush your teeth in each quadrant. This is a big help for me since I never know how long I have been brushing. We don’t have a clock in our bathroom. Another cool thing that I liked was the two types of brush settings- Clean and Sensitive. The Clean setting is good for plaque removal and cleaning while the Sensitive setting is good for cleaning your gums and other sensitive areas. I use both settings when I brush my teeth. My teeth aren’t sensitive like John’s are. He would probably use only the Sensitive setting if he had a brush like this. He tried to take my brush when I first got it in the mail, but there’s no way I was giving it up. I told him to get his own!! The Oral-B Pulsonic Toothbrush easily reaches those hard to clean areas in your mouth. My old toothbrush would never reach the back teeth and I was always getting lectures from my dental hygienist that these areas were the ones with the most plaque. The design of the brush can get at those areas so I am curious to see what the dentist will have to say on my next visit. Hopefully, they won’t have to scrape as much plaque off my teeth as normal. Just the sound of the tool scraping my teeth gives me chills- like fingernails on a chalkboard! It comes with two brush heads- one for your regular cleaning and a precision tip for hard to reach areas. The precision tip is good if you have braces or other dental work. I’ve been fortunate to not have any dental work, but I like using the precision tip at the back of my mouth on my molars. They are very close together making them the most difficult area to clean. Overall, I love my new toothbrush. I like that its rechargeable, cleans my teeth easily so they feel great, and I think it has made a difference in their appearance. They seem a bit whiter than normal. It is supposed to remove 94% of surface stains in just two weeks. I threw away my old toothbrush and am now using Oral-B Pulsonic Toothbrush exclusively- lovin’ it! The Oral-B Pulsonic Toothbrush has a suggested retail price of $89.99 so it is a bit of an investment, but one that is worth it. There is a coupon to save $10 on their website so Canadians, please check it out.